Our mission at Tucson International Academy is to work as a team to prepare students for a global society through foreign languages, technology, community involvement, and high academic achievement. Today we live in a global community with a global economy. That means children need a quality education with a global emphasis, and at Tucson International Academy our goal is to prepare our students to lead the way for tomorrow. In our Foreign Language program, we offer native and non-native speakers’ Spanish and Mandarin Chinese to all students, grades K-12. For the intellectual development of a child, learning a Latin based language with its complex grammar, like Spanish, sharpens the mind. Whereas a language like Chinese deepens the mind. Chinese is the language of the future, it is spoken all over Asia as the language of trade and is becoming important in the world of computers. If a child learns English, Spanish, and Chinese, he/she can communicate with 75% of the world! Thus, TIA’s World Language Program is an essential part of our students’ education. Chinese is being taught to all age groups. We offer formal Chinese lessons and Chinese center times, combining language instruction with cultural activities such as music, art and field trips taught by a fluent Chinese-speaking certified teacher. We focus on basic conversation, including character writing. The older children learn how to read simple stories and write more characters. As part of an academic program, they are also introduced to Chinese history and modern China. In 2014, our students got to participate in our second trip to China and toured Beijing and Shanghai. Since 2002 we’ve had our Spanish program active and growing. We are offering Spanish-centered sessions several times a week on different levels of proficiency as well as bi-weekly formal instruction given by a native Spanish-speaking certified teacher. Language instruction is tied to cultural activities, including story telling, speaking, reading and writing. 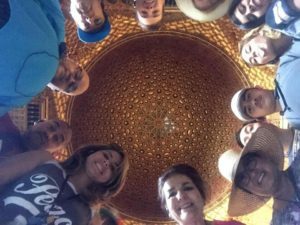 In 2004, 15 faculty and students took a 1 day “friendship tour” to Mexico. In 2007 and 2016, faculty and students went on a tour of Spain and Morocco. Tucson International Academy is offering Spanish and Chinese as part of the academic curriculum. Every enrolled student has the opportunity to study all levels of Spanish and Chinese in a developmentally age appropriate setting. Q. Why should children learn a foreign language? A. Knowing a foreign language is an asset for a young person in today’s global economy. It greatly enhances employability and broadens the scope of careers a young person can choose from. Aside from all these benefits in travel and communication, studying a foreign language furthers the intellectual development of your child. It deepens the understanding of the English language, broadens vocabulary and enhances writing skills. Children learn to see the connections between languages and between cultures, which leads to a better understanding of history and current events. Q. When is the best time for children to learn a foreign language? A. Very small children have the ability to learn the language of their immediate environment in a very short time. However, they cannot retain a language if the environment changes. They will absorb a new language as fast as they forget the previous one. Only when they reach school age (usually at six years of age) is their brain capable of retaining a second language. Until children reach adolescence, they are also capable of learning any language without accent; and with constant exposure they will become and remain bilingual. The ability to learn a language accent free disappears during adolescence. And even though a foreign language can still be acquired at any point later in life, it will be a much more painful and time consuming process. It is very difficult to become truly bilingual later in life. The biology of the human brain dictates that the best time to acquire a foreign language is between the ages of six until the onset of adolescence. Q. Can a child learn more than one foreign language? A. In many multi-ethnic countries (in Switzerland, for example), children grow up being schooled in more than two languages, whereby one language is always the native (first, official) language, and the other languages are taught as foreign language. Multilingualism is a reality for many children in the world today. The human brain is capable of handling the challenge. Q. My child is already bilingual, does it make sense to study one of the languages as a foreign language? A. Even if a child is bilingual verbally, chances are that one language might get neglected when it comes to reading and writing. Correct spelling, grammar and usage, reading and writing are part of any sincere foreign language program, that any child can benefit from.